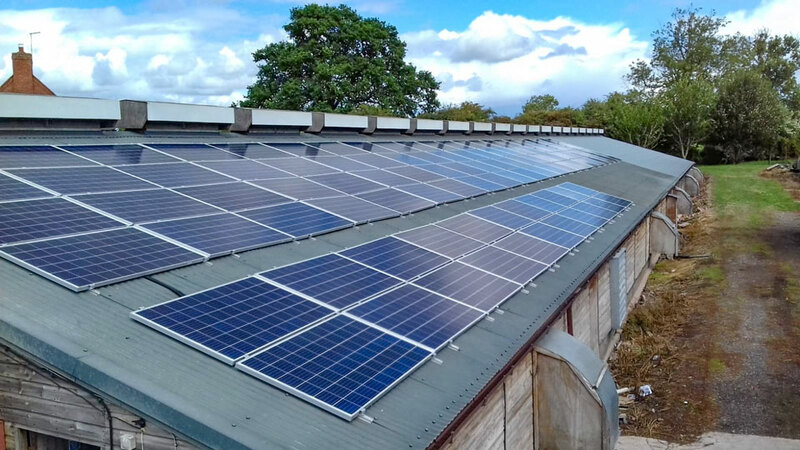 Atlantic Renewables recently installed a 15.12kWp solar panel system on a farm building for an agricultural client in Cheshire. 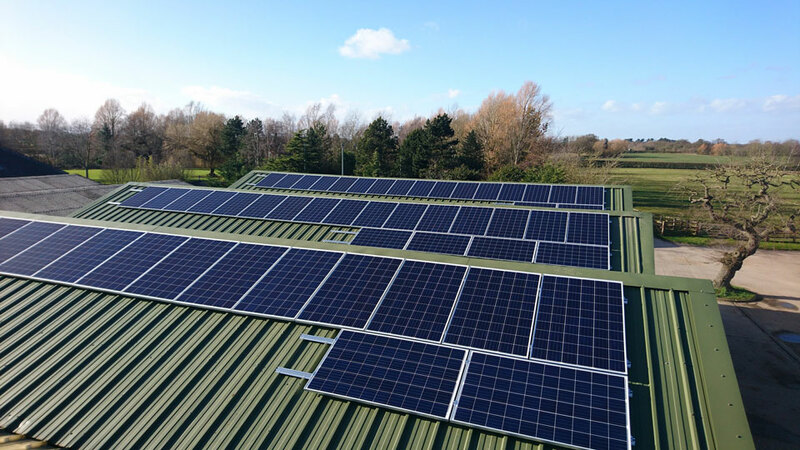 We provided a full EPC service as part of this, including the design, grid application, installation and commissioning of the solar project from start to finish. This agricultural solar project involved installing a system on a trapezoidal-sheet roof. Our trained solar roofers solved this by fixing the solar panels to the roof using an aluminium solar mounting frame, which is corrosion proof and comes with a 10-year warranty for extra peace of mind. Atlantic Renewables used 54 x polycrystalline JA Solar panels (tier one) for this agricultural solar project. These panels are known for their conversion and yield efficiency, as well as their reliability, coming as they do with a 12-year warranty and a 25-year performance guarantee. The most exciting part of the system, though, is the high-tech 15kW 3-phase SolarEdge inverter, which allows each solar panel to function independently. This means that each solar panel has its own power point voltage tracker so that, if one solar panel were to fail, the other panels would carry on producing electricity at peak output, ensuring maximum reliability. The system also comes with an online monitoring function so that the installer and owner can track solar panel performance. And should anything go wrong, the monitoring system will provide an error message explaining the issue. This can be seen via the SolarEdge monitoring portal or the SolarEdge app, so you can even have access from your phone. On top of this, SolarEdge inverters come with a 12-year warranty, as well as a 25-year warranty on the individual power optimisers. They therefore promise years of clean, hassle-free power. Farms typically operate 365 days a year and cannot afford any downtime. But Atlantic Renewables completed this installation in only two days, working quickly and efficiently to minimise disruption, so the project was finished without disturbing animal livestock or interrupting feeding. We also did all of the paper work in-house, saving the client from boring admin work. This included the feed-in tariff application form and the MCS Certificate. With the feed-in tariff scheme, you will receive tax-free payments from your energy provider for every kilowatt hour you generate (rates here). This can be especially valuable on agricultural properties, which often have roof space to spare, over the 20 years that the scheme lasts after signing up. In addition, our solar electrician provided an installation certificate, and we notified the local distribution network that a solar system has been installed to comply with G59 Grid regulations. With wholesale energy prices rising, many agricultural bills are getting close to 20 pence per kwh unit. But with solar available during peak load, farmers and agricultural businesses can minimise the impact of these rising energy costs. Solar can therefore offer more than a 12% return on investment. Another bonus of investing in solar, aside from tax-free electricity, is that your business can claim capital tax allowance against business profits in year one. This means you can deduct the full value of the solar installation cost from business profits before paying tax in that year rather than deferring over a number of years like other plant and machinery. More and more farm owners are therefore realising the benefits of solar energy. And with our experience, as well as the standard 10-year warranty on systems we install, you can trust Atlantic Renewables to provide the best solar solution for your unique energy needs. So, if you have a property – domestic, business or agricultural – in the Cheshire area and you would like to receive a free solar quote, email or call Atlantic Renewables today.